When a snowstorm hits a few days before you planned to hike the Santanoni Range, you go anyway and pray for the best! Probability of the trails on a remote range being broken out? Zero to none! Nevertheless, during the wee hours of that Sunday morning, we were ready to give the mountains our best. Mallory’s brother, Parker, was a last-minute addition to our hiking weekend and joined us for the adventure to the Santas. We hit the trailhead around 6:40 a.m., and after a few minutes of getting situated, we were on our snowshoeing way to the Santanoni Range, with high hopes and full of spirit! The forecast graced us with bluebird skies, but frigid early morning temperatures. I put my hand warmers in right away. The weather warmed up as the day progressed, thankfully. The trail had been broken out all the way to Panther Peak, as we later found out. A group of 4 trailblazers tackled that brutal job the day before. 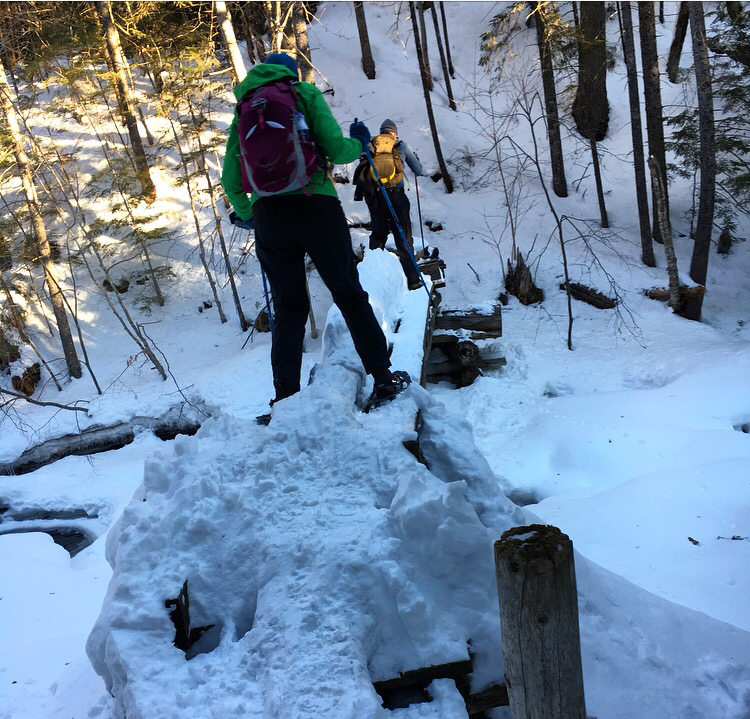 There was 50 inches of new snow on the trails that weekend…breaking trail. It is not my favorite so we were thankful to have the road to Panther “snowplowed”, at least. Mallory and I had studied every map, blog and picture about this range, in the planning stages of this crazy hike. Besides being predominantly trailless, the cairns and tree carvings were most likely buried under enormous amounts of snow. Herald Square would be identified with ease because the trail was carved out for us. Times Square, however? Well that was a different story called “Big Boulder, Sloppy Cairn.” But we’ll get to that in a bit. First off was the 4 mile hike into Bradley Pond. This portion of the hike is, in fact, marked with blue trail markers. Sunrise in the mountains…it never, ever gets old. That early morning peace encapsulating everything it touches. A mystical silence. A quiet prayer. A new hope for a new day. Amen. The air temperature was in the single digits, so much so that frozen hair made an early morning appearance. The hike into Bradley Pond was fairly straight forward. Some gentle hills, or so they seemed, on top of all the snow. The bridge that is out was interesting! Because the bridge that is “in” was like a frozen jungle gym barely hanging on, itself! We just walked across the frozen brook on the way back, when we were tired and thinking much more clearly. I finally made it across as well. Mallory, always ready to capture action shots, shouted her “freeze and smile!” An hour of hiking down, many many more to go! Blue trail markers, tall pines donned in glistening icicles, and snow-capped fungi favorites joined us as we trekked on for a few more miles. Hiking with a sister and brother is definitely a fun experience! Enjoying the day was the theme for the duo, as this old lady had to remind herself not to hike on hyper-speed. Our friend Helene calls it “mountain goat-ing.” Haha. Seriously though, thank goodness for them! 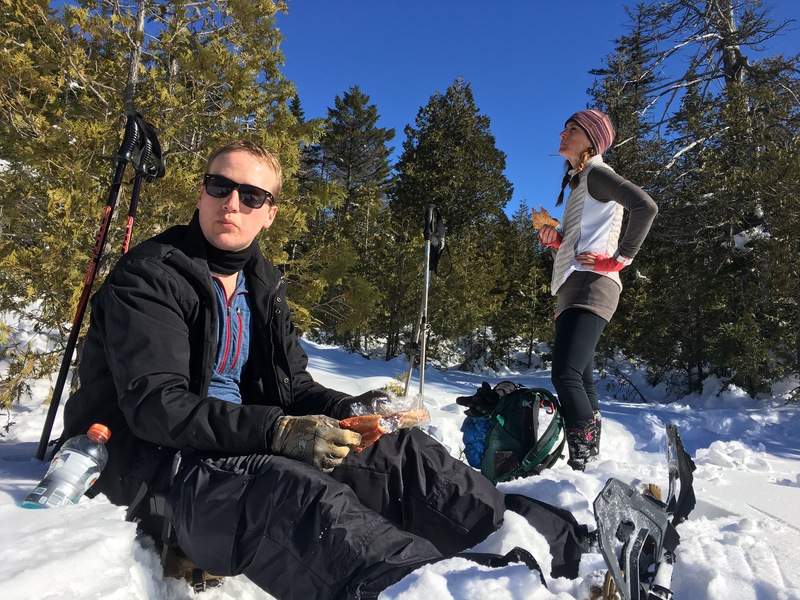 Around 9:45 a.m., after a few detours and bushwhacking, we snowshoed across Bradley Pond and plunked ourselves down for the first official food break. Frozen pizza, dark chocolate (for me) and some hydration revived our muscles and soul. The weather warmed up quite a bit, and the sunshine rejuvenated our spirits. I think I was staring ahead, contemplating whether that peak peering over the trees was our first destination, Panther Peak. Hmmm…she pondered. After 20 minutes, it was time to begin our ascent up to Panther Peak. A previously, broken out trail. The ascent was steep in many sections. I imagine we were snowshoeing over rock slides and boulders. 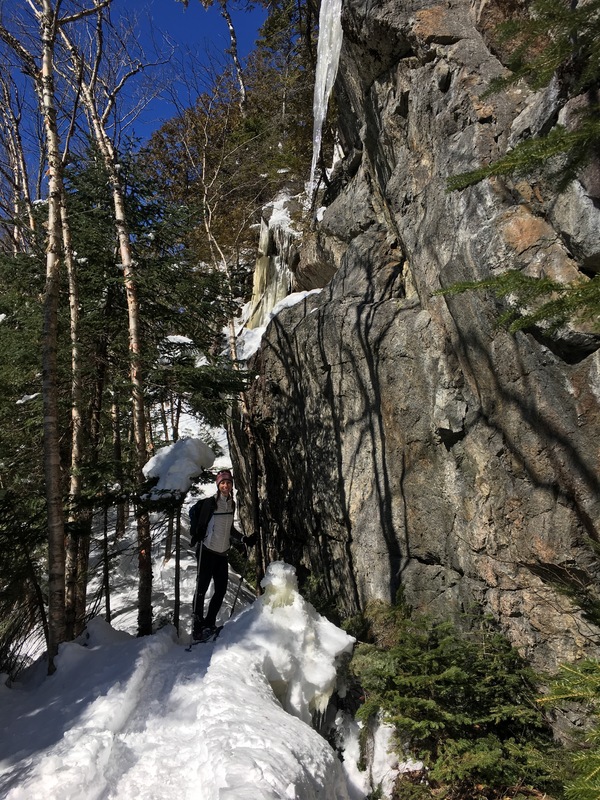 Even with the slamming of the snowshoes into the inclines, the trail narrowed into tricky “up , up, up we-goes”. Incredible rock features all along the way! Yellow painted markers live on the stone walls to let you know that you are on the track! Onward! The “dance of the hiking jackets” continued…layer on, layer off. On, off. Hot. Cold. We journeyed on to Herald Square…continually declaring, “We have to be there soon! Is this it?” Nope…keep on keeping on. After about 20 minutes from departing the brook, you reach a clearing. Well, we were standing on 4 feet of snow, so who knows what this looks like in the summer. Nevertheless, all you needed to do was turn around and there she was…. That view was enough motivation for our legs to press on. Herald Square revealed itself at noon, 5 hours after we began our journey. The tree carvings directing the way were quite low to the ground. 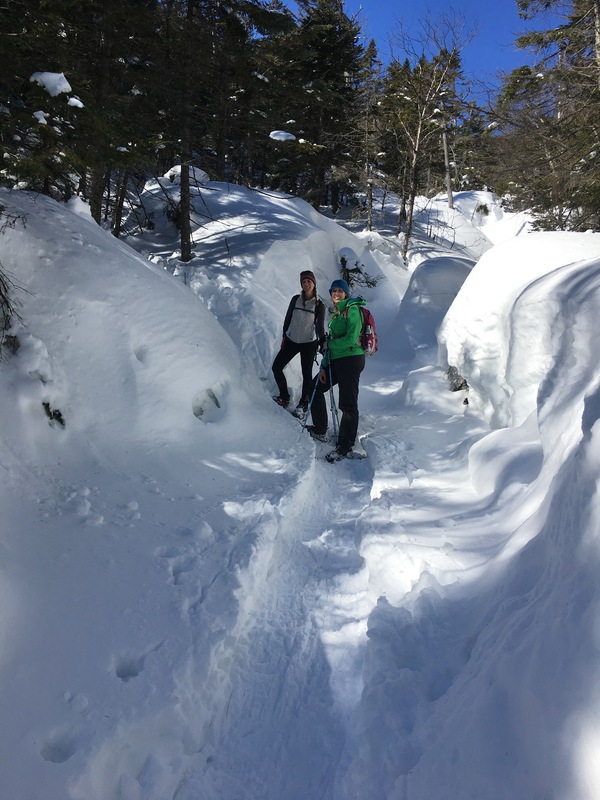 There may also be a cairn under all the snow, but again, no clue for these winter hikers. It was a quick 10 minute walk up to Panther Peak from Herald Square, it almost wasn’t fair. And…at 12:20 p.m., the summit of Panther Peak! Panther Peak stands at 4,442 feet tall and is the 18th highest of the 46 peaks. It also marked my 30th high peak and 15th winter peak at that! I loved the perspective of the MacIntrye Range from this direction, as well as Mount Colden. So beautiful. Panther was also Mallory’s 7th peak and one more to the bunch that Parker accomplished as well! The temperature was close to 40 degrees at the summit. The distance to Panther alone was 6 miles…although it felt further because of the elevation gain. Capturing moments to keep forever. The Seward Range. I’ve said it before and I’ll say it again: the mountains are more beautiful in the winter. Snow reveals the definition, the dimension, the perfection of every peak. As we took off the snowshoes and relaxed once again, the reality of the remainder of the hike set in. We would have to make the call if we attempt to break trail or not. We all agreed that Couchsachraga Peak would have to be orphaned. So left to debate was: Break trail to Santanoni Peak or turn around and hike back out? We gazed at Santanoni Peak from Panther, checked and rechecked our maps, trying to judge the distance. Maybe 1.5 miles? But the trail is unmarked and buried under 4 feet or so of snow. According to some blogs we researched prior to our day, we would need to follow the tree carving to Couch toward Times Square. Our other dilemma was the desire to return to the main trail before dark. We noticed the trail to the Santanoni Express blazed so we would only need to break trail from Panther to Santanoni along the ridgeline. My bum hip was beginning to act up, but I was not ready to let that stop us just yet. Therefore, after almost 40 minutes of tea, hot cocoa and food, we made the descent back to Herald Square. This is where “Big Boulder, Sloppy Cairn” began. And by that, I mean, Jen perseverating on finding these benchmarks. Big boulder, sloppy cairn marks the spot of Times Square. (“Did she just say, Big boulder sloppy cairn again?”) However…sloppy cairn was buried and big boulder looked like tiny boulder when standing on 4 feet of snow. This is not my photo (obviously) of Times Square, but I was obsessed with finding, at the very least, Big Boulder. We were definitely standing on Sloppy Cairn. We headed west at first, quickly realizing we were on the trail towards Couch. So back around we went, but not after falling into a few spruce traps! Ok…so tall brother and tall sister only fell into their knees. Short old lady fell in up to her chest! It was an adventure for sure. Then we proceeded south toward Santanoni. I checked the compass as Parker and Mallory checked the map, as well as used their instincts. We would find the trail….then lose the trail, then back track and find the trail again. Breaking trail. Finding trail. Losing trail. Break. Find. Lose. For about 2 hours and only 2 miles of our most valiant trail-forging efforts, we made the decision that our safest bet was to turn around. Turn around and descend the way we came. Our bones were weary, our spirits were fading. So…a return to the Santanoni Range in better weather would have to be in the future. At 7 p.m., we signed ourselves O.U.T of this climb! Phew. A big ol’ phew! Total Distance: 15.5 miles with a couple of trail breaking miles. Total Time: 12 hours, with plenty of breaks. 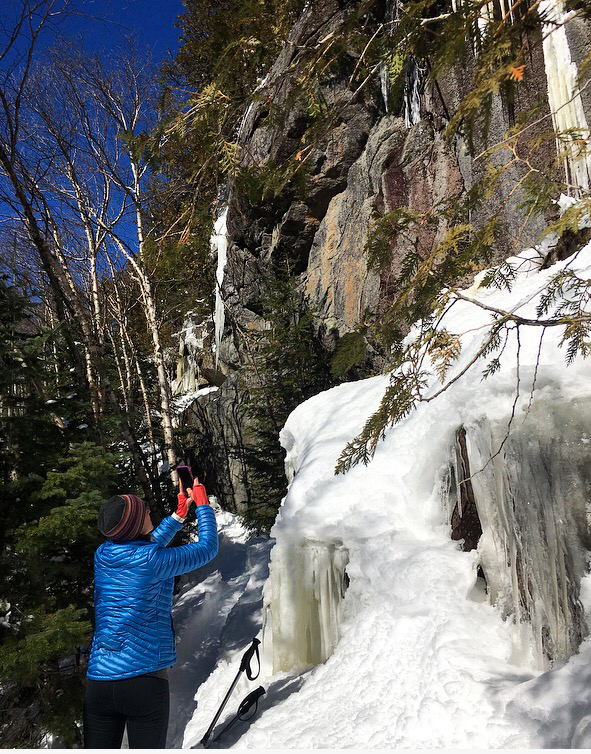 Although our original plan was to hike the entire range, we were still rewarded with beautiful blue skies, great company and even better #frisbeebuttsliding. Oh yeah, and one more high peak conquered! Playing smart was our best play of the day! We were blessed with mountain miracles and summit memories that kept us smiling for days. I could not imagine a better way to slide into the finish line of winter hiking than with these two beautiful souls. Because at the end of the day, what matters is how much you laughed and how much you loved.